NORMAN — After leading Oklahoma to a win at No. 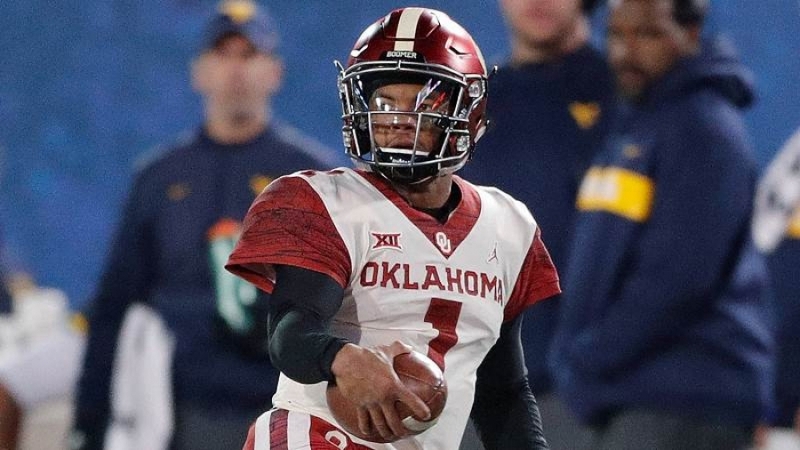 12 West Virginia on Friday to clinch a spot in the Big 12 Championship Game, quarterback Kyler Murray was named Big 12 Offensive Player of the Week, running back Kennedy Brooks was named Newcomer of the Week and kicker Austin Seibert was named Special Teams Player of the Week, in a vote by media who cover the league. Murray earned the Big 12 Offensive Player of the Week award for the fifth time this season, tying the single-season conference record set by Texas running back Ricky Williams in his Heisman Trophy-winning year of 1998. The redshirt junior threw for 364 yards and three touchdowns, and ran for 114 yards and a score to propel the Sooners to the 59-56 road victory. Murray was 20 for 27 through the air and averaged 13.5 yards per attempt and 18.2 yards per completion, and averaged 12.7 yards per rush thanks in part to a 55-yard TD run on OU's first possession. He also completed a critical first-down pass on 4th and 5 with just over two minutes remaining that allowed the Sooners to run out the clock. This was the second time this season the Allen, Texas, product passed for 300 yards and ran for 100 yards in a game, and he is the first Sooner to ever do so once. Murray is the only player to ever average at least 300 passing yards and at least 60 rushing yards through college football's regular season. Murray has registered six games this year of at least 300 passing yards and at least 65 rushing yards, the highest FBS single-season total since at least 1996. Brooks, from Mansfield, Texas, was named the league's Newcomer of the Week for the third time this season after rushing for a career-high 182 yards and a touchdown on 21 carries (8.7 average) Friday. The redshirt freshman broke away for a 68-yard TD run that gave OU a 28-21 lead with 3:30 left in the second quarter. The contest marked his third straight with at least 165 rushing yards, and fifth this season to break the century mark. Brooks now leads the nation with his 9.6 yards per rush. Seibert, from Belleville, Ill., earned the Special Teams Player of the Week honor for the second time this season and sixth time in his career. The senior scored 11 points on Friday, making all eight of his extra-point tries and his only field goal attempt (a 37-yarder). Eight of his 10 kickoffs went for touchbacks and he punted one time for 45 yards. The OU and Big 12 career scoring leader also moved into third place on the NCAA's all-time kick scoring list (now has 476 career points). The Sooners have claimed a league-high 12 Big 12 weekly honors this season. No. 5/5 Oklahoma (11-1, 8-1 Big 12) faces No. 9/9 Texas (9-3, 7-2 Big 12) in the Dr Pepper Big 12 Championship Game on Saturday at AT&T Stadium in Arlington, Texas. The game will start at 11 a.m. CT and be televised by ABC.